While Jeremy was in the UK I took his horse Danire to a local 50. Elaine took her Rocky Mountain horse, Hershey. It was an elevator ride so Elaine was starting with the LD and depending on how hot it was going to be she would either do the LD or elevate to the 50. Danire and Hershey went around nice and easy together. We had fun. At the halfway point, we were arriving into our 1 hour hold as the leaders were getting ready to head back out and it was really getting hot so Elaine decided 25 was enough for Hershey. I went out to do the rest of the 50. I had trotted the first half of the ride and now for training purposes I planned to canter the rest. Danire went around at a nice canter for the rest of the ride and won by a healthy margin. The leaders had not expected to see me so that was pretty fun. Danire also won BC and high vet score. This was his first ride after his 100 in the UAE in Jan.
Jeremy flew back from the UK to the USA just in time for the Biltmore. We took six horses, Elaine hauled two for us and we took the other three. We had Kellora, Sinister, Errow, Benz, Lou and Code. We brought Errow to trade for a new horse as the two horses (Errow and the new horse, Gus) seemed more fitting for opposite riders. We did the trade right when we got there. The new horse is named Galloping Gus, he is an 11 year old SamTiki son. Jeremy did his feet and vetted him in for the 50 on day one at the Biltmore and I was to ride Kellora. It would be Gus's first 50. We vetted in and then went out to dinner. It was fun, the town there at the Biltmore is really cute. The next morning we had a rootin' tootin' Gus. He would protest any time you aimed him away from the starting line while warming up, pretty entertaining for observers. It was the strangest thing! How did he even know where the starting line was?? It was clear that he definately did though!! The ride was fun until Kellora got pulled at the first vet check. Gus went on to finish with Jeremy. After Jeremy finished we pre-rode the horses for the 75 that was happening the next day. Our friend Judith Ogus had flown in to ride Sinister with us. I would ride Lou, Elaine would ride Benz and Jeremy would ride Code. On our pre-ride Sinister seemed to have sore feet... Dang. Jeremy did some adjusting to his feet after the ride but Sinister had taken a chunk out of his hoof the week prior and that seemed to be the culprit. In the morning we warmed up and all crossed the starting line but within 25 feet of crossing the line Sinister was clearly not able to do the race. He was pulled, bummer as he literally went 25 feet. The day was pretty out on the trail. The horses all did a good job and all finished. It was Code and Benz's first 75 as well as Elaine's first 75. We drove home on Sunday and we were driving to the airport on Monday. It was the week of the Windsor race when we flew to the UK and got things prepared for the ride. Jeremy and Chachie would be doing the race as well as Nicki. While we were there we got to see our mare Cleo that Nicki and Andy now own and her stunning new Tiderbret foal. Very fun to see. The race had beautiful scenery from what I could tell from crewing. It was on the Windsor Estate grounds. The Queen of England was even at the vet check for a while as well as the Crown Prince of Bahrain and Sheik Mohammed. The vet gate was like that of a World Championship. Beautifully laid out with big catering tents for all. The ride had very lumpy footing as well as a large amount of pavement. At the last vet check Chachie was pulled. He had a great CRI and he was sound but he looked lack luster and didn't really want to trot down the muddy, sticky trot lane. Bummer. Nicki finished on Bold Grayson. Lisanne Dorian also finished on her own mare Tulip (King's half sister). Our crew was super, as usual. This time we had my mom Jean, Lynn Kenelly, Sarah Engsberg, my brother Jonathan and Adam Farmer. Great group of fun friends. After the ride was all said and done and we had returned to Nicki and Andy's the real fun began. We were toured all over the countryside and given many history lessons from Andy. We also went to London and toured around. Amazing, colorful history. We really enjoyed ourselves tremendously. We even got to see the opening or Parliament. The Queen went by in her carraige and then we even got to go inside of the lobby (the original room where the word lobby originates) to watch the whole ritual of black rod and all of the proceedings. Very special. The trip was amazing. We all made it back to the USA. Rictik and Chachie included:) It was now almost time to get loaded up for the big trip out West!! Geez. We went to the Camp Osborn ride with Gus and Lou. We also took Benz and Code as we would be doing a hand off at a gas station on our trip back to Florida. Lynn and Misty had offered to help haul horses to Ft Howes so we would not have to haul to Montana, back to Florida then to California. Instead we could go to Montana and continue on as they would shuttle the extra horses and keep them during our California trip. Gus was not right and Jeremy rider optioned part way through. Lou was terrific and came in 4th with Best condition and high vet score. This ride was fun. There was even a lake to swim in as well as water slides to play on. Good times for sure, lots of families out having a great weekend. On our way we stayed at the Olson's for two nights. We had a fun time as usual and hung out boating on the Missippi River for the day. From there we did two short days (by crazy people's standards). The first day we went to a horse hotel and went out for dinner. It was really fun, we also got to visit with our good friends Christina and Jeff Martin and their new cute baby Brekken. We arrived at Ft Howes without a mishap. Lou, Code and Benz had been there all week already. There were alot of boring details with team stuff etc. but we will skip that stuff. Day one I rode Liger on his first FEI 50. He did super. He won the ride and looked fantastic. That was really fun to ride one that we raised. Day two was the 100 mile time trial for the World Championship Jeremy rode Danire and I rode King. The pair were doing great together. Around mile 40 King felt off. I pulled up and walked in, he was "off and on" sound. By the time I reached the check he was sound enough to trot soundly down the lane. I decided to rider option. He got all A's but we weren't even halfway through the ride and something was wrong. Jeremy and Danire had a great race. The last loop there was a three way race between Meg Sleeper, Ellen Olson and Jeremy. The end was a surprise. Meg had it won on her Anglo as he is very fast but at the last tiny bit she let off and he spooked, giving Danire the opportunity to blast past in the last 10 feet of the race. It was very exciting to watch. Danire won, Meg was second and Ellen third, all three horses looking spectacular right there together. Meg won BC by 1 vet point. Danire was runner up. Our crew was stellar again. We had Misty McAdams, Lynn and Aiden Kenelly, Adam Farmer, then Yanica Haasbroek and Kelsey Russell jumped in later in the day and eventually myself as well as a few other people that lent a hand. There were also some first time riders who really had no idea what to do that our crew crewed for. Very sweet. From here we changed our mind on what horses we thought we would take West. Originally King and Danire were not going to go to CA. Then we decided we wanted Danire to go for training in case they selected him for the team. We took King for training as well. We decided to take Lou, Code, Chachie, Benz, King and Danire to CA. Only Liger stayed behind. He went to stay with Misty while we were in California. We pulled out of the ride site after the awards and went 4 and a half hours to Paradise Valley to visit our friend Carl Knutchel. Adam had flown in and was now driving back to CA with us. On our way we hit an epic hail storm. We were thinking we might lose our windshiled over it!! CRAZY!!! We arrived at Carl's, put the horses up and went to dinner at Carl's restaurant. Very yummy!!! After dinner Jeremy, Adam and I went to Chico hotsprings for a soak. Mush deserved relaxtion time:) The next morning we went for a scenic ride up in to the mountains. Jeremy rode Chachie, Adam was on Benz and I rode Code. It was a pleasant and beautiful walking ride. That afternoon Carl taught us all how to fly fish. We weren't a successful bunch but we had a lot of fun! We ate at Carl's restaurant again to try more of the menu. We hit the road that evening. We wanted the horses to not have to be hot going through Nevada so we drove at night. We arrived at Adam's around 2 pm. We were all spent. We relaxed for a couple of hours and then went to get a massage! There's a great place that we spent a lot of time at last summer that we hit up. It's $25 an hour!! Too great. Within three days of arriving we were at the Wild West endurance ride. We rode day 2 and 3. On day 2, I rode Hillorie Bachmann's horse Cuyucos on the 50 with her. Jeremy rode Chachie who came in 3rd or 4th, I don't remember. Day 2 Jeremy rode Benz for his first time and I rode Code for the first time at a race. The Florida horses weren't too sure about the substandard footing! By the second half of the ride they were figuring out how to deal with rocks. These two Tevis horses had a steep learning curve. The rest of our stay here at Adam's has been super. It has been a combination of running, swimming, riding, visiting friends, riding, massage's, riding and having a great time. A couple of days before the Tevis we got an email that dismissed Danire and Jeremy from being considered for the World Championship team so we switched Jeremy from riding Lou to Danire. Danire did not have any Tevis preparation. He had won the FT Howes 100 6 weeks prior but didn't have any trot training or hill work. Danire is much further along in his career than Lou. The Tevis was really fun as always. We went up to the start on Friday. Elaine and her husband Guy met us up there. Benz, Code and Danire were the lucky team. All three vetted in and looked great. The ride meeting was brief. Bed time was upon us and we fell asleep. That night it got down to 38!! It's a first for me to have to put the heavy winter blankets on the horses at Tevis. It was also a first to start in more than a t-shirt. We only had one crazy thing happen, going up the second canyon, into Michigan Bluff Benz stepped off the edge of the trail/cliff. Her left front went off the trail and she was teetering off the side. I looked down and it was crazy STEEP and about 1000 feet down. I yelled to Elaine to jump off. She quickly bailed off as the mare went off the edge that was on our left. The mare did a 180 as she slid down, so now we were to her left and the downhill was to her right. Her right hip caught one of two trees that were there. That stopped her sliding. Then she took a step away from the tree, (so now she might slide to her death) all the while she was looking up to us on the ledge. 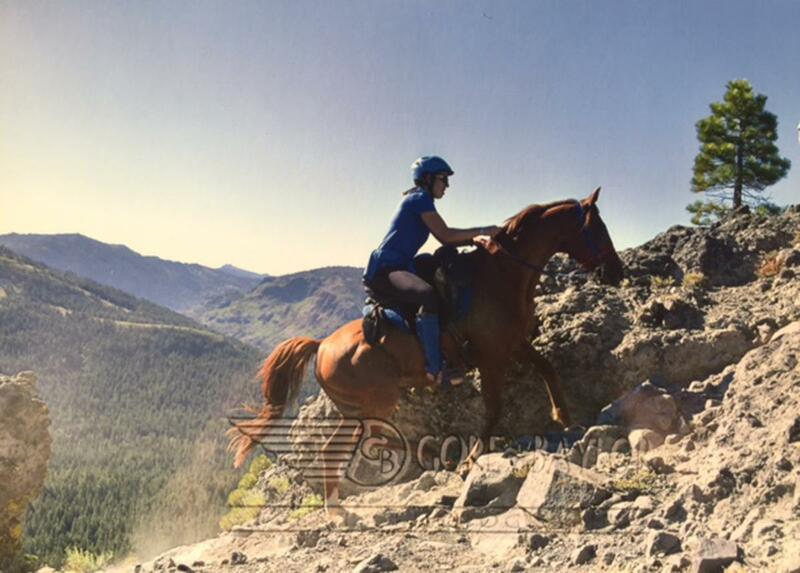 She was about two horse lengths down when she gathered herself up and made a Hail Mary leap/scramble to the trail. She made it!!! So SCARY!!! I had jumped off Code the moment she went down and now I was clearing the area as best I could on a tiny lip of a trail on the side of this drop off. She just had enough room to be there. All of the riders behind us (about 5 or 6) were silent. It was stunning. Both horse and rider were unmarked and fine. Shortly after that all of the riders let out sighs of relief and we all wanted to get the heck out of there. It was the craziest, near death thing I have seen in a long while. Luckily the rest of the day went well. We would also get updates along the way that Danire and Jeremy were doing well. The memories of that day are abundant and fun to recall. Our crew was amazing. We had my mom Jean, Lynn Kenelly, Adam Farmer, Will, my sister Hannah, Guy Lemieux, Emma and Giulia Orth, Tammy and Adam's mom and sister Laura and Jenna. In the end we finished at 4:40 am. Code and Benz did their first 100 and Elaine did her first 100. It was fun because our old horse Sam Samstar did from Francisco's to the finish with us and finished right with us as well with his owner David Shefrin. My head hit the piloow at 7 am. I was up at 9 am to help get Danire ready for the Haggin Cup judging. We are all resting this week and will head back to Florida Monday. See you all out on the trail.